In mid-May, Apple launched a beta version of a revised MobileMe Mail web application. The updated version went live along with an update application switcher in mid-June. Mail is not the only MobileMe web application getting an overhaul, however, as Apple has announced a similar beta program for a revamped Calendar web application. As with the Mail beta, testing of the new Calendar application requires that users request an invitation through the MobileMe site, and Apple will be rolling out invites over the next several weeks. The Calendar beta includes a new web application at me.com with great-looking calendar views. You'll find redesigned day, week, and month views, as well as a new list view to make scanning your events easier. Your calendars will also load faster, thanks to improved performance. The new web application works best with Safari 5, Firefox 3.6, and Internet Explorer 8. 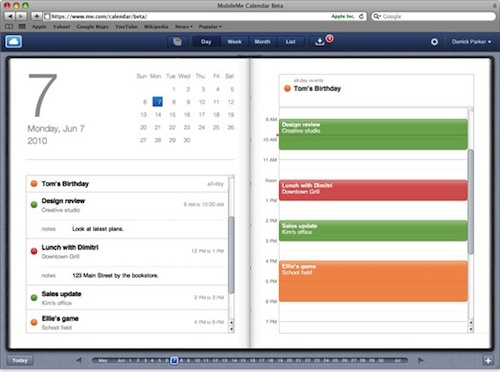 Other improvements include new tools for sharing calendars among MobileMe members, publication of read-only public calendars viewable by anyone, event invitations with RSVPs, and compatibility with the CalDAV standard to allow viewing and editing on calendar applications on both Macs and Apple's iOS devices. Apple has posted several support documents about the Calendar beta, including an FAQ and a list of known issues.